The general conceit amongst males in their twenties and thirties is that no matter how badly some may wish us to, we will never grow up. I look at my life at a quarter of a century old, and wonder if I will ever be married, or for that matter, successful. Most importantly, I often ask myself if I ever would want these things. Stay young and independent they say, and to some extent that statement has merit. Will Freeman (Grant), the central character in the stunningly touching and humorous About a Boy is the suitable poster child for the lifestyle desired by so many. He does nothing for a living, is smashingly wealthy and has eschewed any sort of real responsibility for the better part of his life. Living off of the royalties of the song Santa's Super Sleigh, which was his father's one and only successful songwriting creation, Will describes his life as an island where he is the lone inhabitant; in short, he is a self-centered cad whose shallowness is worn like a badge of honor. Then much to his surprise, he meets a single mother and comes to realize that dating is much easier when dating single parents. With this new knowledge, Will ventures into a support group for single parents called S.P.A.T (Single Parents Acting Together); his single purpose is to meet more attractive single mothers while pretending he has a child of his own. Things work quite well and soon Will is dating an attractive mother who introduces him to Marcus (Hoult), an odd child whose mother Fiona (Collette) is dealing with severe emotional problems. Will's first day with Marcus is marred by an attempted suicide by Fiona as well as a realization by Marcus that Will would be the perfect remedy for his mother, if only he could get them to want to be with one another. Things fail to mesh between the pair, but a bond is struck between Marcus and Will, one in which each will learn something about life from the other. The original source material is the novel by British author Nick Hornby, whose High Fidelity was transformed into one of the best films in recent years. The pages of my original hardback edition of About a Boy are torn and tattered, and like so many of the authors' works, I read it several times a year. What Hornby understands about the male condition is what makes his work so special. With Will, Hornby has crafted perhaps his best protagonist; Will is so egocentric it becomes charming. 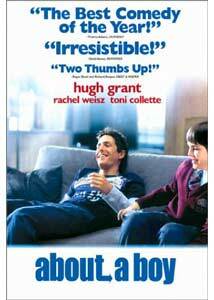 The casting of Hugh Grant in the role also helps solidify Will as a terrific fictional creation. Grant�s performance is truly award worthy as he shows nearly every emotion so perfectly that you feel for the guy even when he is getting what he deserves. It would have been easy to make About a Boy into an overly sentimental story of two males and their battles with maturity and romance. But screenwriters Paul and Chris Weitz, joined by Peter Hedges, take the better route by allowing each character a chance to grow and expand beyond any sort of stock cliché. The use of voiceover narration adds to the proceedings as the viewer is allowed a look into the minds of the characters and the inner workings of their personalities. Finally, the subtle and often overly sweet use of an original score by British artist Badly Drawn Boy offers a collection of instrumental as well as lyrical songs that fit perfectly into the overall tone. Image Transfer Review: Presented in a 2.35:1 anamorphic widescreen image, this is a pleasant enough transfer, though the film represents London so well that the drab and muted colors take away from the often splendid sharpness and detail. Bright colors, when offered, are done very well as is evident when Will goes for a stroll with a date in a park early in the film. At other moments the use of drab browns and other earth tones come off nicely. Some slight edge enhancement can be noticed occasionally throughout the film, nothing offensive but it is still enough to notice. Audio Transfer Review: English and French Dolby Digital 5.1 mixes are offered, though neither takes full advantage of the Dolby Digital moniker. Dialogue is the star of the mix as it is clear and crisp throughout and is always easy to understand. The surround speakers are used sparingly, largely as backup for the musical score. Extras Review: Though not labeled as a special edition, the extra features are exciting and informative without a single weak link to be found. First is a feature-length commentary track by directors Paul and Chris Weitz that is as funny as it is informative. The pair spends a great length of time discussing the adaptation of the novel to script form as well as the choice to keep it largely British-based. There is humor to be found throughout the track, but what is most impressive is the pure love that the pair have for the film. The Spotlight on Location featurette is largely promotional and deals mostly with the directors, Hornby, and the cast talking about one another with a large amount of praise. It is interesting to hear from Hornby, but the short length left me wanting to hear more about the transformation from book to script. Some of this is covered in the commentary, but hearing it from Hornby would have been amazingly insightful. Seven deleted scenes are compiled together with optional commentary by Chris and Paul Weitz. The quality of the cut scenes are on par with those of the finished film. Some may have served a purpose in the finished film, but there are a few that seem unnecessary. English to English Dictionary is a hilarious three-minute look at the use of some of the vocabulary in the script. Some you may know, some you may not. The lyrics to Santa's Super Sleigh are here in all of their glory, as are a pair of music videos by Badly Drawn Boy, Silent Sigh and Something To Talk About. Both are worth a watch, but the latter is an amazing tune that I can not stop listening to. A short video trailer for About a Boy is available as are trailers for A Beautiful Mind, Erin Brokovich, The Family Man, Meet The Parents, Notting Hill, as well as the upcoming Johnny English are each offered. Filmographies and production notes round out the extra features. As fine a film as I have seen in a long time, About a Boy is an absolutely perfect motion picture. As good, if not better than Hornby's novel, this is very easy to highly recommendation.